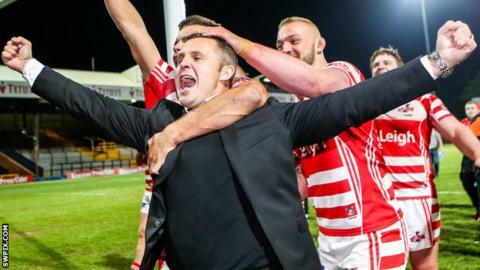 Leigh Centurions head coach Paul Rowley says the whole town can be proud of their season after beating Featherstone in the Championship Grand Final. Rowley's side comfortably won 36-12 at Headingley after taking an early lead. The Centurions lost only once during the regular Championship season and finished 15 points ahead of Featherstone, who were second. "I'm proud for the players because it's what they deserved. It means that I get to be proud and I feel that the guys have had a just reward for all their hard work and endeavour." Leigh managed a record 15 wins in a row at the start of the season, and continued their excellent form in the play-offs to win a first Grand Final in 10 years. "I just thought with the ball we were a bit too sharp at times and I don't think you can defend some of that stuff today, it was a bit vintage," Rowley told BBC Radio Manchester. "We're lucky we get to share such lucky memories with some great people in that dressing room." If they repeat the same feat next season, Leigh will be back in the Super League after the Rugby Football League opted to re-introduce promotion and relegation. Leigh finished bottom in their only season in Super League in 2005, and have failed to get a licence for the top flight since then.